Kokoa Hoto is a positive and energetic girl who becomes friends with anyone in just three seconds. After moving in with the Kafuu family in order to attend high school away from home, she immediately befriends the shy and precocious granddaughter of Rabbit House cafe's founder, Chino Kafuu, who is often seen with the talking rabbit, Tippy, on her head. 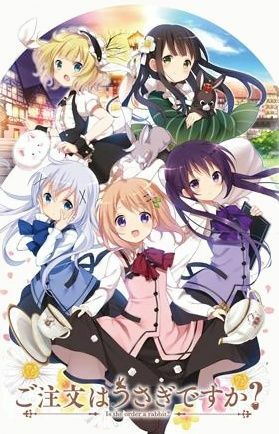 With fluffy silliness and caffeinated fun, Gochuumon wa Usagi Desu ka? is a heartwarming comedy about five young waitresses and their amusing adventures in the town they call home.